Peru is famous for its camelids, members of the Camelidae family -- and relatives of camels -- who are found both wild and domesticated in parts of South America. In the Old World, camelids exist in two well-known species: The dromedary (Arabian camel or Indian Camel; one hump) and the rarer Bactrian camel (two humps). Their New World relatives, however, lack the telltale one-hump/two-hump characteristics, so it’s not quite so easy to tell them apart. 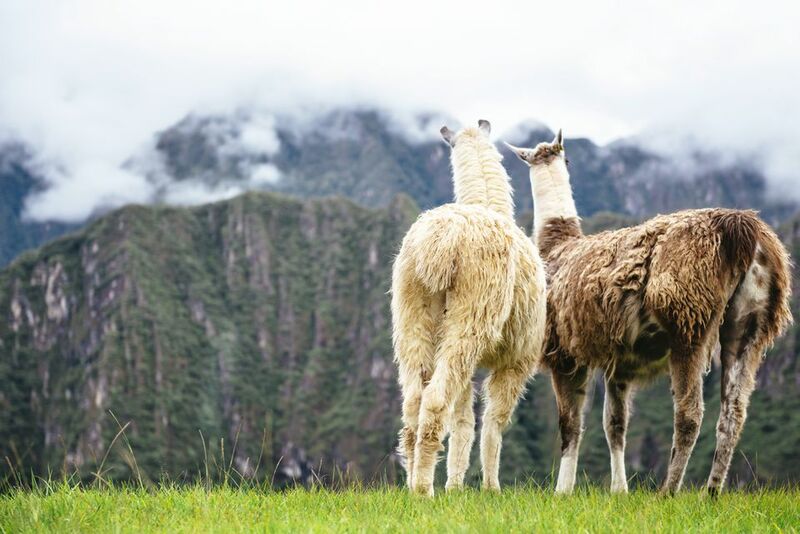 If you’re heading to Peru, there’s a good chance you’ll find yourself staring at an alpaca or leering at a llama, gazing at a guanaco, or looking at a vicuña. But how do you know which is which? Never fear: read this straightforward camelid spotter's guide to llamas, guanacos, alpacas, and vicuñas. They have two-toed feet with soft pads that move for greater grip. They have a three-chambered stomach, unlike other ruminants such as cattle, pigs, and sheep, which have four-chambered stomachs. The red blood cells of all Camelidae are oval in shape, a feature not found in other mammals. 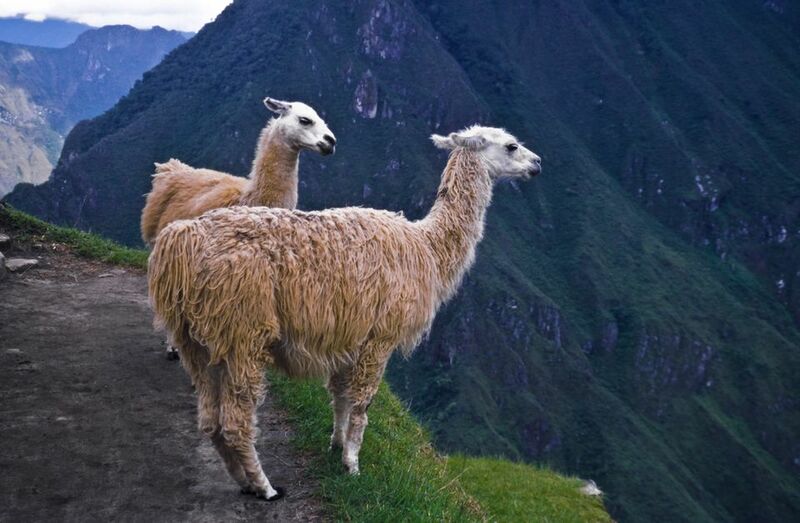 Camelids are official flagship products of Peru, with an emphasis on the more commonly exported alpaca. Llamas and alpacas can crossbreed; a cross between a male llama and a female alpaca is called a huarizo. Baby llamas, alpacas, and vicuñas are called crias (from the Spanish word cría, meaning “baby” when referring to animals), while baby guanacos are called chulengos. The llama (Lama glama), along with the alpaca, is one of two domesticated camelids in South America. It is the largest of the New World camelids, reaching heights of about 4 feet (1.25 m) at the shoulder or 6 feet (1.83 m) at the top of the head. A fully-grown adult llama typically weighs between 300 and 450 pounds (135 to 205 kg). Llamas are descended from wild guanaco and were domesticated in the Andean Highlands of Peru some 5,000 years ago. They were vital for pre-Inca civilizations such as the Moche (100 AD to 800 AD) as well as for the Incas themselves, providing fiber, meat, and dung (for fertilizer). Llamas were also important beasts of burden in Peru, a country with no other pack animals prior to the arrival of Francisco Pizarro and the Spanish Conquistadors. According to the Oklahoma State University Department of Animal Science, llamas often carry 25 to 30 percent of their body weight for five to eight miles but are not ridden except by children. Modern uses of the llama are similar to those of the past. Llamas are still used as pack animals in the Andean Highlands and can pull a small cart if needed. Peruvian craftspeople use the llama’s soft, warm, and luxurious wool for spinning and weaving clothing and other knitwear items for sale both locally and internationally. Llama meat is still eaten in Peru, where it is typically served as a steak or dried to make charqui (or ch'arki, the original Quechua word from which the English word "jerky" is derived). One other role is reserved for a select few llamas at Machu Picchu, where they graze freely and help keep the grass nice and short. The llama’s size and general bulk set it apart from the sleeker and smaller guanaco and vicuña. It also varies in color (including white, brown, grey, and black, either solid or spotted), unlike the guanaco and vicuña. The llama’s longer head, neck and “banana-shaped” ears set it apart from the smaller alpaca. Do llamas spit? Yep, they sure do. But this normally occurs only when the llama feels threatened or irritated. In general, llamas are particularly social herd animals (they even like to hum to each other). When correctly raised, llamas are also good around humans -- including children -- and demonstrate a calm but very curious attitude. Guanacos, along with vicuñas, are one of two wild camelids in South America. They are found primarily in Argentina, but also roam the high plains and mountains of Peru, Bolivia, Chile, and, to a lesser extent, Paraguay. Guanacos also exist in the Atacama Desert -- the driest desert in the world -- where they survive on water-bearing cacti flowers and lichen. The guanaco (Lama guanicoe) is the second tallest New World camelid after the llama -- and one of the largest wild mammals in South America -- standing at between 3.6 and 3.8 feet (1.10 to 1.16 m) tall at the shoulder. Adults typically weigh between 175 and 265 pounds (80 to 120 kg), significantly lighter than the bulkier llama. Genetic research indicates that the llama is the domesticated form of the guanaco. Like other South American camelids, guanacos are herd animals, living in groups comprising a single territorial male with his family (or harem), all-male groups or groups of adult females with their young. Guanacos are valued for their luxury wool, comparable in quality to cashmere and almost as prized as vicuña wool. Guanacos, however, are vulnerable to recreational hunting and poaching and therefore both they and their fiber are relatively rare. The entire population is below 600,000 animals, while there are about seven million llamas and alpacas in South America. According to the IUCN Red List of Threatened Species, “At the national level, guanacos are likely to become extinct in three out of the five countries comprising their historic distributional range.” Peru has a population of only 3,500 guanacos and there is a real threat that the guanaco could disappear from the country altogether. Guanacos are more slender than llamas and alpacas, with long legs, a long neck, and pointed ears. They have longer heads than the similar but more delicate vicuña. Guanacos differ slightly in color on a regional basis but do not differ nearly as much as llamas and alpacas. Colors range from light brown to brownish yellow or brownish red; the belly, rump, and backs of legs are white; the head, ears, and nape of the neck are grey. Guanacos are herd animals and exhibit levels of cautiousness expected from wild animals. If threatened, a guanaco can spit over a distance of 6 feet (1.8 meters). They also communicate by bleating and by tail and ear positions. For example, ears up means the animal is relaxed; ears forward means the guanaco is alarmed; ears laid flat is a sign of aggression. Guanacos defend themselves against predators -- most notably the mountain lion -- by running as a group at high speeds. Adults can run at speeds of 40 miles (64 km) per hour, while baby guanacos, called chulengos, can run soon after birth. The alpaca (Vicugna pacos) is one of two domesticated camelids in South America, the other being the larger llama. Alpacas are descended from wild vicuñas, while llamas are descended from wild guanacos. An adult alpaca stands at about 3 feet (0.91 m) at the shoulder and 4.5 to 5 feet (1.37 to 1.52 m) from the toes to the tips of the ears (making them smaller than llamas and guanacos but larger than vicuñas). Male alpacas normally weight between 140 and 185 pounds (64 to 84 kg); females tend to be smaller, weighing from 105 to 150 pounds (48 to 68 kg). Alpaca herds are found on the highland plateaus of southern Peru, Ecuador, northern Bolivia, and northern Chile. According to the Food and Agriculture Organization of the United Nations (FAO), about 80 percent of the global population (at least three million) is found in Peru, primarily in the southern regions of Puno, Arequipa, and Cusco. Alpacas were domesticated in Peru thousands of years ago. Unlike the llama, which served as a pack animal, a source of meat and a provider of wool, the alpaca has long been bred for its fiber alone. Alpaca wool is considered one of the finest wools in the world, being soft, warm, luxurious, and hypoallergenic. There are two breeds of alpaca: The huacaya and the suri. Huacaya fleece is dense and grows vertically from the body with a natural waviness or crimp. Suri fleece hangs down in long and extremely silky pencil-like “dreadlocks.” Huacaya alpacas are far more common than the suri breed, accounting for about 90 percent of the global alpaca population. Alpacas most closely resemble a small llama rather than the more slender guanaco and vicuña. They often have a “teddy bear”-like appearance due to fleece growing thickly on both their legs and faces. Alpacas come in a variety of natural colors, ranging from white to black with various shades of greys and browns (the international alpaca wool market officially recognizes 22 natural colors). Alpacas are intelligent, curious, and gentle animals. They normally live as social herd animals within family groups containing one dominant male, but can also be trained as pets and are happy to depend on humans. Like llamas and other camelids, alpacas sometimes spit when threatened, aiming their unpleasant projectiles at other alpacas or sometimes at nearby humans. Alpacas make clucking noises to show friendly or submissive behavior and often hum when they are content. Despite the spitting, alpacas are particularly hygienic animals, using a communal dung pile to avoid polluting their grazing areas. The vicuña (Vicugna vicugna) is the smallest and most delicate of the four South American camelids. An adult vicuña typically reaches a height of between 2.5 and 2.8 feet (0.75 to 0.85 m) at the shoulder, with weights ranging from 77 to 130 pounds (35 to 59 kg). Along with the guanaco, the vicuña is one of the two wild camelids in South America. Alpacas are domesticated descendants of the wild vicuña. Vicuñas were protected by Inca law prior to the Spanish Conquest. Only the Inca royal family could hunt vicuñas or wear prized vicuña garments, with severe punishments dealt out to poachers and illegal traders. Vicuñas were hunted with impunity after the fall of the Inca Empire and the population dropped to near extinction. By the 1960s, only 6,000 or so vicuñas were left to roam the semi-arid and windswept highland plains of Peru, Argentina, Bolivia, and northern Chile. The vicuña is the national animal of Peru and appears on the country’s coat of arms (as seen on the nuevo sol coin). They are also protected by law throughout the nation, but poaching remains a problem. Vicuña wool is extremely sought-after on the international market. It is also one of the most expensive wools in the world thanks to its luxurious qualities and its rarity. Vicuñas can only be shorn every three years; in Peru, the herding and shearing of vicuñas are controlled by a government-sanctioned chacu, a communal herding system that dates back to Inca times. Vicuñas are similar in appearance to guanacos, but are smaller, more delicate, and have shorter heads. Their ears are pointed like those of the guanaco and both species share similarly colored fleeces, being light brown on the back with white hair on the throat, belly, and legs. Vicuña herds -- typically a family group comprising a male, several females and their young -- roam at altitudes of between 10,000 and 16,000 feet (3,050 to 4,870 m) above sea level (heights at which humans can suffer from altitude sickness). Guanacos are more widely distributed at heights ranging from sea level to 13,000 feet (3,900 m). Vicuñas, like guanacos, are shy and wary of intruders. They have excellent hearing, better eyesight than other camelids and can run at speeds of 30 miles per hour (50 km/h). Like other camelids, vicuñas can spit when threatened.